Christmas is upon us and as the festivities and free flowing drinks start to ramp up and our training usually begins takes a back seat. Gyms start to get quieter as peoples social calendars begin to fill up with work Christmas events, family parties, and end of year drinks. Here are some sure fire ways to keep you motivated over the December period. 1. Make a promise to yourself and tell someone to hold you accountable. Remain consistent over the break and make a promise to yourself you will attend 2 classes of either Muay Thai or Kickboxing a week. Consistency is the key to success in anything in life. Taking 1 month off training is a terrible mistake and leads to a long hard road back in January 2018. It’s taken you a year to get where you are now, so don’t let it all go to waste. Did you know that de conditioning starts happening a week after no training! How to action: Message your coach or training partner now and tell him you will commit to the 2 sessions per a week over the December period. Be specific! Eg I will commit to Monday 7:15pm Beginner Muay Thai and Thursday 7pm Muay Thai all throughout December. 2. Get a head start on your 2018 goals. Set your 2018 training goals early and get a head start. Who says you have to wait for January 1st to start? If you start now you will be 3 weeks ahead of schedule. Accountability is an important factor when it comes to setting goals. There is no point setting them if no one is keeping you accountable. Sometimes keeping yourself accountable just isn’t enough. Tell your coach your goals or post them on a public forum! How to action: Set 2 short term goals. One to be achieved before December 31st 2017 and one to be achieved by January 31st 2018. When you have goals you have direction. Make sure your goals are SMART: specific, measurable, achievable, realistic, time bound. Eg: I want to train 3 hours a week every week until December 31st & I want to drop 1.5kgs by the end of January 31st 2018. 3. Change your mindset. So many people see training or attending classes as a chore or something they “have” to do. How about changing the way you think through positive self talk, reinforcement and changing the way we think about training. “I WANT to go to training because it will leave me feel more energised” or “I WANT to go to training because this is my time to do something I enjoy”. Next time you catch yourself saying “I can’t be bothered going training tonight but I know I have to” replace it straight away. How to action: Like with everything, this will take practise. Everytime you catch yourself pre framing training in a negative mindset use your positive self talk to pre frame it in a positive light. This type of positive reinforcement will make guaranteed changes to the way you think and approach training. 4. Muay Thai / Kickboxing / Boxing are one of the highest calorie burners. This fact alone should be enough to get you into the gym! Did you know that a kickboxing session will burn twice the amount of calories compared to a light paced jog. So would you rather spend 1 hour doing a boring slow paced jog or 1 hour training in a fast pace, high intensity Kickboxing session? How to action: We are all so busy this time of year so why not maximise your work out time by engaging in activities that will get the best results. If you know you have a Christmas party on a certain date, schedule in a Kickboxing class the day before. 5. Reflect and look back at why you started. This time of year is a great time to look back at where and why you started training Martial Arts. Why is this important? Because it give you an opportunity to look at how far you have come and if you achieved the goals you set out to achieve from day 1. We get so caught up in our busy lives that we forgot to sit down and reflect on out journey and our achievements. How to action: Set aside 10 minutes at the end of the day to sit down and think about why you started training Martial Arts. Take a journey back to your first session. Fast forward to where you are now and look how far you have come. Don’t compare yourself to other people because we are running our own race. The old way of doing things in combat sports especially boxing and Muay Thai has been to skip, hit bags, hit pads, hit people, and do a few hundred push ups and sit-ups. They’ve done it for centuries so it must be best practice? Not necessarily. Too much open ended training (e.g. open bag work is throwing any combination you feel like, open ended sparring is sparring with no intention or purpose and just doing what ever) lead to slow and minimal results for the general population. Of course if you spend long enough doing something you will eventually make some improvement, but what if there was a better and more efficient way? I recently attended a Boxing certification course that was run by Boxing Victoria and presented by two coaches who were involved with the Australian and Victorian boxing teams. They used the term “performance outcomes” in many of there coaching philosophies and coaching methods. Performance outcomes are a pre determined result that you want to achieve from a situation e.g. sparring round or training session. They would let an athlete know that there performance outcome for a set sparring round would be to work the lead body shot. This meant the athlete would spend the entire round of sparring focusing entirely on the lead body shot, and in turn would make improvements through focusing on the single performance outcome they are trying to develop. Normally, during “open” sparring rounds, beginner to intermediate level combat athletes always get overwhelmed with the amount of things they needed to think about e.g. footwork, guard, punching, defence, and cardio. This usually results in them under performing and not being able to put anything together. They simply don’t posses the motor neural skills to work everything in sync let alone use them effectively. Intermediate to advanced level athletes tend to stick to only practicing things they are good at because they don’t feel comfortable working on weaknesses, or might be a blow to the ego to not be good at something all over again. Perhaps it’s a bit of both. Eventually this leads to gaping holes in there games when it comes to competition, and by that time it’s too late. There weaknesses are exposed in the fires of competition. As a coach it’s our role to identify these weaknesses and minimize them before competition. 3. Weave opponents lead hook & counter rear straight. Footwork is the foundation of all combat sports and the single most important factor to everything you do. I worked a few drills to get people moving there feet and upper body for slipping and punching. It was a smaller class today so we practiced shadow boxing singular punch technique then moved onto the bags to practice the punches. I had the class focus mainly of the punches they were going to use today. Assuming that everyone was able to perform each set skill individually and properly this is where I started to introduce different variables. Stage 1 – Perform the 3 combinations with a partner in sequence. Heart rate starts to increase and athletes feel more pressure to perform. If athletes can’t perform at this stage (delivering all three combinations in sequence with minimal error) then we slow it down or go back to singular combination practice. During this stage athlete A is a feeder and athlete B is the boxer. They stay in there roles for the entire round. Stage 2 – Assuming the athlete can perform Stage 1 close to perfect we introduce the next variable. Randomization. The combinations are no longer in sequence and athlete cannot anticipate and must now react. There is a short pause between combinations and gradually reduced if the athlete can handle the new load. During this stage athlete A is a feeder and athlete B is the boxer. They stay in there roles for the entire round. Stage 3 – Assuming that the athlete can perform Stage 2 close to perfection then we introduce the next variable. Randomization but turn for turn based. This is even closer to simulating sparring, but athletes only have to work 3 different punches and only 3 counters. Short pauses are mandatory between each combination and gradually reduced as the athlete begins to master this stage. At each level I introduced more variables to stress the athlete and constantly test them. If they can’t perform at a certain level then we slow it down or even move back a level. Did I meet my performance outcome of teaching my 3 skills I wanted to athletes to develop? Yes. More importantly I coached them to think for themselves a lot of the time rather than spoon feed mindless technique. At the end of the day this style of coaching won’t suit you if all you’re after is a scripted fancy pad work video you can post on your Facebook to impress your friends. My gym is about world class coaching for everyone. Learning like this will make you a better boxer in the long term. So many “coaches” these days live off old glory days and stick with the same old format and try to smash there athletes with 10 rounds of pads to impress others. That’s cool that you can hit 10 rounds of pads with someone barking mindless combinations. I’d rather my athletes be known as technical, intelligent fighters with beautiful technique rather than the person who can do 10 rounds of lousy technique on the pads. It’s been freezing cold all day and you just got home from work. All you can think about is what you are going to have for dinner and how good its going to be to lie down in your cozy bed. Oh wait… you still have to go training. The inner dialogue begins “I’ll just train tomorrow instead….it’s too cold to leave the house tonight…they won’t even notice I’m not there” and you gradually talk yourself into not going. Don’t worry, we’ve all been there before. Why is it that people struggle to stay motivated to train in winter? Don’t stress because you are not alone. Here are some ways to help you get over that winter training rut. One of the first things your should do is set some short term and long term goals. I talk about this a lot in my posts mainly because I think it’s very important when it comes to Martial Arts training. You should always set goals from the beginning both long term and short term. They need to be S.M.A.R.T; specific, measurable, achievable, realistic, and timely. Set yourself some short term goals over the winter to keep on track with your training. They can be things like “I will commit to training 2 days a week over winter” or even something that will span out over the winter period like “I will start boxing over the winter and commit to training 1 boxing class per week”. Here is my challenge to you: at the end of this article set yourself the following: a 2 week goal, a 1 month goal, and a goal to be achieved before the end of winter. If you’ve only ever trained Muay Thai then how about trying a completely different Martial Art. Brazilian Jiu Jitsu? The plus side is that you get to train in a very warm looking uniform and it’s something completely different. Things will definitely feel uncomfortable from the start because like picking up any new skill it will take time and dedication. You will feel like a complete beginner again but that’s the beauty behind Martial Arts, it’s about constant learning and personal growth. Sometimes training a completely different Martial Arts breaks up the monotony of your current training regime and can be just the thing your soul needs to reignite your passion for Martial Arts. Treat yourself if you’ve achieved a goal. I’m not saying going on a binge drinking bender and a bucket of KFC. I’m talking something more along the lines of doing something for yourself like buying that new pair of shoes you’ve been eying off. In this day and age we are so quick to buy presents and gifts for other people but rarely treat ourselves. You are the most important person in your life so why not spoil yourself every now and then. Buy yourself those new pair of gloves because you committed to training 3 times a week over the winter period. You will meet a lot of like minded people when you train Muay Thai. When you train regularly you will end up spending a lot of time with them and get along with some really well. Next time you come into the gym start chatting to people and make some new friends. The good thing about this is that you start forming bonds and keeping each other accountable. Set some days with your training buddy where you both show up together. That way you both train together and develop together. Most importantly you will get that reminder from them “are you coming training tonight?” and also “I didn’t see you at training tonight? Where were you?” Sometimes it’s small things like these messages that will keep you consistent and on track. In this day and age there are so many apps and gadgets on the market that are geared towards fitness and Martial Arts. Heart rate monitors, FitBits, Apple Watches and even Hykso boxing punch sensors just to name a few. All these devices are a great way to monitor your progress and it’s the small achievements that will keep you motivated. I bought myself a polar heart rate monitor a year ago and use it to monitor my calorie expenditure during work outs. I have a daily calorie expenditure target I need to meet and can track it very accurately using the heart rate monitor. We all know that we tend to over indulge over the winter period. The problem with this is that combined with a sedentary lifestyle and very little activity we end up piling on the weight. Rather than waiting for summer to do something, why not overhaul your “diet” in winter. I don’t like the word “diet” because diets are unsustainable. I prefer using the word “lifestyle change” because it’s something you want to be able to maintain for ever. Things like cutting out sugary soft drinks entirely or only having a alcoholic drink once a week are a great way to start. The good thing with the Australian winter is that it only lasts for 3 months. If you train hard and consistently over the Winter then you will reap the rewards over the Spring and Summer. So many people leave it too late to “get fit” for summer because by the time summer comes around it’s already too late. There is that old saying that summer bodies are built in winter. At the end of the day the weather shouldn’t affect your training habits. Hopefully some of these tips will help you overcome the temptations of staying at home in front of the heater and keep working towards achieving those goals. You just joined a Martial Arts gym and they offer a Muay Thai program. You’ve done a few sessions and feel like you’re getting the hang of things. You’re finally learning the basics but getting a bit overwhelmed with all the combinations, techniques and what to use when. Don’t stress because you are not alone! You have embarked on a lifelong journey and aren’t expected to know everything straight away. As ancient Chinese philosopher Lao Tzu best put it “The journey of a thousand miles begins with one step”. Here are a few tips to help you survive your first few months of training. In September 2016 I took a team of 5 people from Team Nemesis to train at Yodyut Muay Thai in Thailand. The group consisted of members from a wide demographic and skill level. What they all had in common was a passion for Muay Thai. I usually train in Thailand myself on a yearly basis, but for this group of 5 it was a first time experience. What to do around the island? If you are like me and love your sun, pools, and beachside lifestyle living then Koh Samui is the place to go. I’ve been coming here for the past 10 years and just keep coming back. The island has so much to offer from all the touristy type day trips like elephant rides, shooting ranges, and snorkelling to relaxing poolside at your resort and quiet little hide away beach side restaurants. For this trip I decided to stay at the Imperial Boathouse Resort, which was absolutely amazing. It’s located in Choeng Mong and a 2 minute scooter ride from the gym and about a 15-20 minute walk. A scooter will cost you between 200 – 300 Baht per day ($8 AUD) and definitely worth the investment if you are confident in your riding and like to explore the island at your own pace. There are a whole bunch of night markets that operate on different nights including the Bophut (Friday night) and Lamai Market (Sunday night). If you are there for training then the stadiums are definitely one to check out. The fights are hit and miss with some complete mis matches and some very good quality bouts. Check out Chaweng Stadium and Samui International Stadium. Yodyut is a gym that caters for people of all levels. Our group consisted of people with different athletic abilities and Muay Thai skill levels. The trainers were able to work with everyone in the group and provide them all with an enjoyable learning experience. Sometimes the groups within the gym were split to accommodate the differing skill levels. Eg; the more experienced members and fighters would clinch while the newer and beginner levels would be working technique work with the trainers. Even though the gym caters for complete beginners to the seasoned pro I would advise that you arrive in good shape and have a good understanding of the basics of Muay Thai. You will get the most out of training when you arrive in shape because you aren’t letting your fitness hinder your learning. I would also advise that you currently have a good technical understanding of the basics in Muay Thai before training abroad. You will get a lot more out of the one on one training and pad rounds when you have a good understanding of the basics. The Thai trainers are a wealth of knowledge when it comes to ring craft and how to execute and set techniques up effectively. What are the positives at training at Yodyut Muay Thai? The actual gym itself if located in Choeng Mon. Away from the busy districts like Chaweng and Lamai but close enough for a short bike ride. Close to beaches and pools this is the perfect area for those who don’t like to be right in the midst of the busy tourist areas. All good gyms have a great vibe and atmosphere to them. The people, the trainers, and culture of a gym is what makes it great. This is exactly what you have at Yodyut Muay Thai. Friendly and welcoming trainers who will go out of there way to help and teach you. They are passionate about what they do and it’s evident in there coaching. The gym still has a very Thai style method of training. Skipping, pad rounds, bag rounds and clinch work. No secret formula, but just good old fashion hard work. They have a number of currently active Thai fighters who work in with the general population, giving guidance and advice. One of the best things about Yodyut is that you rotate through all the trainers on the pad rounds. Each day you will be allocated a different pad holder. Each trainer has a speciality and there own style. The best part about working with different pad holders is that you can take something away from each of them. Son is the owner of the gym and has had over 250 fights. He has a technical but aggressive style of Muay Thai. He has been training people for over 10 years and has taught all over the world. Within Thailand he has worked at Sinbi in Phuket and Kiatphontip in Bangkok. He is quietly spoken and has excellent english skills. NongBee is a former Lumpinee and World Champion. Having had over 150 fights he is renowned as being a technician in fighting and also in coaching. He has fought some of the best in Thailand including Thongchai To Silachai, Anawat Kaewsamrit, Orono Muengsima, and Saenchai. At first he comes across as shy in demeanour, but once you get to know him he is warming and friendly. He is a fantastic pad holder with good enough english to explain the intricacies of some of the finer details. His style of pad holding is technical and likes to throw in the occasional power technique. P’Chit is one of the OG’s of Muay Thai. He has very limited english, but for what he lacks in the language department me makes up for it with his friendliness and eagerness to teach even with language barriers. As a trainer/pad holder he is better suited for the more advanced students with good understanding of Muay Thai. He is a Thai stylist when it comes to pad holding. His pad holding focused on singular strikes, smaller combinations, and counters. Wirat is a seasoned Muay Thai fighter who fought mainly on Channel 7, and Lumpinee. He is tall for Thai standards and in my opinion, is one of the best pad holders in the gym. When you hit pads with Wirat it’s not just a constant barrage of powerful technique to make you feel good. He likes to fire back with punches and kicks to keep you honest. Some of my best pad rounds were with Wirat because I knew I had to be completely switched on when doing pads with him. He is a great pad holder for the more advanced guys. He has good english. Eyat is Wirat’s younger brother. He is a retired fighter who was also previously ranked at the Mecca of Muay Thai, Rachadamnern Stadium. He has been a trainer for over 10 years and has previously worked at Sinbi and Promthep gym in Phuket. He is very welcoming and fun natured at heart. He is extremely friendly and likes to have fun in his sparring rounds and pad rounds. His pad rounds focused on flow techniques with longer combinations and chaining a lot of smaller counters and combinations together. Eyat has excellent english ability. Chat is a former Muay Thai fighter who fought regularly on Rajadamnern and across the south of Thailand. He formerly worked at Phetchyindee in Bangkok and Rawai Muaythai in Phuket. At Yodyut he worked very closely with the Thai fighters preparing for fights. Chat is a solid pad holder focusing on short powerful combinations and elbow techniques. He is patient was very helpful with explaining the finer details of the techniques. He is great to spar with, especially for the more advanced students. He is a absolute machine and still very sharp and technical in his sparring rounds. Chat has excellent english ability. R is one of the newer trainers at Yodyut. He comes across as very quiet when you first meeting but then warms up after he sees you regularly. He is a former Southern Thailand Muay Thai champion. He likes to focus on short sharp powerful combinations and countering techniques. He will explain a technique where needed but relentless with aggressive style pad holding. The good thing about doing pads with him is that he likes to get tricky by firing off kicks of his own at you during the pad rounds. R has excellent english ability. Firstt and Owen are both currently an active fighter who have also taken on the role as a trainer/pad holder. I had actually met First many years ago at Kiatphontip in Bangkok and it is good to see him all grown up. They are both fairly light but very technical and methodical in the way they explain things. They younger trainers come across as shy at the start (I think it comes down to age and perhaps even confidence because of language barriers) but once they open up they are warming and very keen to teach and show you the sweep they dumped you with in the clinch. Clinching with these 2 was a humbling experience because even with my weight advantage there was nothing I could do against these pure technicians. They have a excellent clinch game and very open to explaining techniques. I would highly recommend Yodyut Muay Thai to anyone looking to train Muay Thai in Thailand and still enjoy the beachside resort lifestyle. You will not only get some good quality Thai style training but be close enough to the beach or pools for some much earned relaxation time. If you have never trained in Thailand before then this is a great starting point. Below I have posted some videos from the other members of the trip on what they had to say about training at Yodyut Muay Thai. Enjoy! It took a while to get up and running but here is the finished product. A short documentary on my life as a Muay Thai coach and co owner of Team Nemesis. ARE YOU “THAT GUY” IN THE GYM? 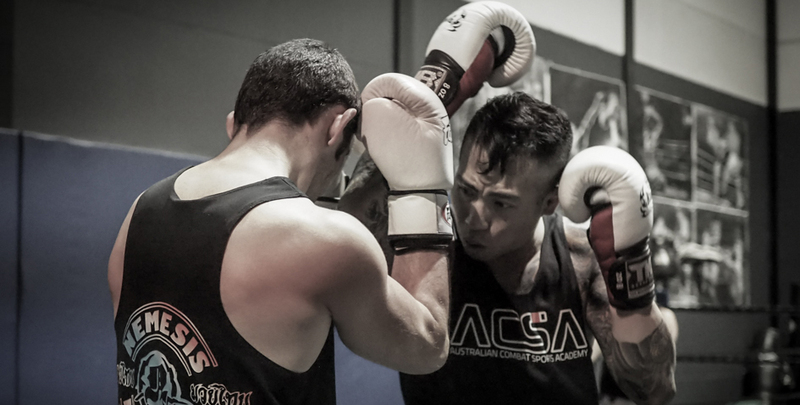 THE DO’S AND DONT’S OF MUAY THAI SPARRING. The coach yells change partners at the end of a sparring round and there is always that one guy left out or stuck with the same partner. Why does it seem like no one wants to partner up with “that guy” in sparring rounds? It’s probably because people have caught wind of his reputation of treating each sparring round like a world title fight.